... in time of war, soldiers, however sensible, care a great deal more on some occasions about slaking their thirst than about the danger of enteric fever. Parliamentaray Debate (21 Mar 1902). Quoted in Winston Churchill and Richard Langworth (ed. ), Churchill by Himself: The Definitive Collection of Quotations (2008), 469. In An Essay on Criticism (Written 1709, published 1711), 14. (Written in 1709). Misquoted in The Monthly Miscellany; or Gentleman and Lady’s Complete Magazine (1774), as “Mr. 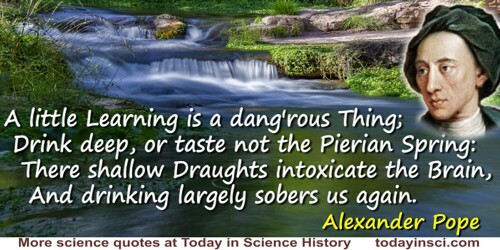 Pope says, very truly, ‘A little knowledge is a dangerous thing.’” This latter version of the quote has, in modern times, been misattributed to Albert Einstein. If you resolve to give up smoking, drinking and loving, you don't actually live longer; it just seems that way. Realism and the Aim of Science (1983), 36. There are fewer chemical pollutants in the air. Our drinking water is safer. Our food standards have been raised. We’ve cleaned up more toxic waste sites in three years than the previous administrations did in twelve. The environment is cleaner, and we have fought off the most vigorous assault on environmental protection since we began to protect the environment in 1970. We are moving in the right direction to the 21st century. Remarks at the University of Pennsylvania in Philadelphia, Pennsylvania (29 Oct 1996) while seeking re-election. On the American Presidency Project web page. [Smoking is] a dirty habit that should be banned from America by the Government, instead of moderate alcoholic drinking. As quoted by Gobind Behari Lal, Universal Service Science Editor, as printed in Syracuse Journal (13 Jan 1933), 4. At the time, there was Prohibition of alcoholic drinks in America. Piccard was interviewed in New York on his arrival from Brussels onboard the Champlain by newspaper and motion picture men. Because he was so vigorously opposed to smoking, he required that nobody smoked during the interview in the children’s dining room.